In Part One we had a quick overview of the Avid landscape, and how to get help. In this part we’ll look at how Media Composer structures data and media, and the typical workflow. At the core of everything is the ‘bin’, which comes from the film days where film strips, reels and spools were dumped into bins. It’s just a virtual container for your media files. When you create sequences, you will be storing them in bins. Bins also contain your media, and anything else you can import for your work. 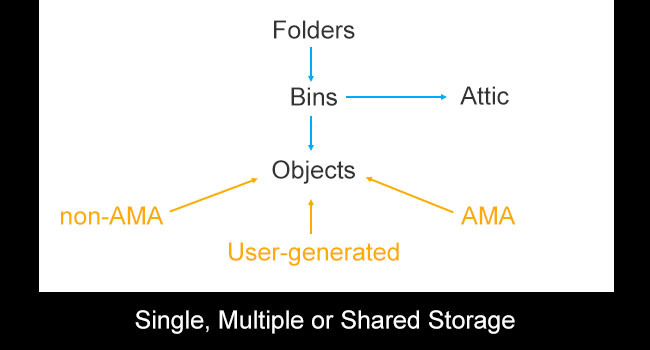 Bins can be shared among different editors. Anything in the bin is an object. These objects can be user-generated (sequences, effects, etc. ), imported file-based codecs (AMA) or ingested/captured footage from tape devices (non-AMA). Avid Media Composer gives you one additional tier of organization, in the form of Folders. You can organize multiple bins into folders, which is a handy feature for large projects where bins can get old and need to be archived, etc. Avid saves your work periodically. Avid is actually saving the specific bin in which you’re working, and this is saved as a backup file in a separate folder on your hard drive, under the name ‘Avid Attic’. You could choose to write a new file or overwrite the existing backup from the settings. Single drives attached to your computer. Multiple drives attached to your computer. By default Avid already knows where to store what, unless you have multiple drives or shared storage. In this case you’ll need to configure your settings to tell it where things must go. This is Avid’s way of telling you that it can edit files natively, similar to Adobe Premiere Pro. Unfortunately, Avid has complicated things a bit by requiring you to download and install a different plug-in for each codec. You’ll find the available plug-ins and codecs here. Once installed, restart Avid Media Composer. To check which plug-ins are installed, go to Tools > Console. You’ll get a command-line console, where you type AMA_Listplugins and hit Enter/Return. Make sure your installed plug-ins show up here. There are some instances where you will need to tell Media Composer which plug-in you intend to use before you work on a specific codec, like in the case of creating profiles for Dynamic Media Folders. Copy to another folder or drive automatically. Link original media or transcoded media to specific bins automatically. Get Interplay to access these clips automatically. All you have to do is drop in media directly from the media card or SSD you shot it in, and Avid does the rest in the background while you can carry on doing something else. In short, DMF is almost an automatic Data Wrangler on set or an Assistant Editor in a post facility. To read how to get DMF working, refer to page 381 of the manual. Copy media files from one location to another. Remove unused media clips in sequences. There are some codecs that cannot be edited natively, even via AMA. These are non-AMA workflows. I won’t be going into tape-based workflows. DNxHD (stands for Digital Nonlinear Extensible High Definition) is an intermediary codec, like Prores or Cineform, that purportedly allows for easier and smoother editing. I am not a fan of transcoding native formats into intermediary codecs to make editing easier. If I have a less-powerful system, I prefer to edit with proxies and preserve the native files until the mastering stage. If it has an X after it, it’s 10-bit, otherwise it’s 8-bit. Chroma sub-sampling is 4:2:2 for all of the above. To know more about DNxHD, click here. Who is Avid Media Composer for? 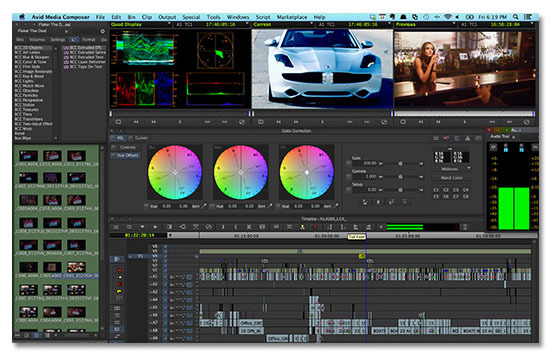 Avid Media Composer is built for a collaborative environment. You must define a User before you can start using Media Composer. Avid supplies the necessary hardware and software to enforce this workflow. Avid provides tools and plug-ins at premium prices but with maximum flexibility. You can generate usage reports and statistics to know who has used it and for how long, what changes were made, etc. These can be exported for printing or record-keeping. You can print images, etc., from the bins directly within Media Composer. Which kind of workflow needs all these features at the same time? In one word: Broadcasting. Another group might be high-end visual-effects driven feature-length features, where media and data might fly in and out from all corners of the earth. What if you’re just a single user looking to edit an indie movie, a short film, a commercial or a corporate video? You could still use Media Composer to do your work, and only you can make that decision. I would stay away. What about if you’re a post house with grand plans? Is it too much to learn and too much to pay? Most of its data features will rarely be used, but you’re still paying for them. When you want to add features, you still have to pay more. At some point, when your post facility grows and demands a more robust architecture, the cost differential between building it with Avid components as opposed to off-the-shelf components is huge. You must be able to see that far ahead – will your business benefit from the ‘Avid’ brand name, and will it generate more revenue because of it? Look how the price of Media Composer has dropped in recent years. Against the onslaught of more nimble competitors, how much longer can Avid sustain its premium and value? Tough choices. What I’m definitely not a fan of is the DNxHD backbone. It works well, mind you, but it’s a round-about way of doing things when applications like Adobe Premiere Pro, FCP-X and Autodesk Smoke can do it directly. However, many professionals find this method to be more ‘simplifying’ – to each his or her own. All said and done, Avid Media Composer is a supremely capable application – it’s what others aspire to become. What it can do, it can do as well as anybody else, and then some. This respect was earned. AMA – if you want to edit natively. MetaFuze – if you want to transcode to DNxHD prior to editing. non-AMA – capture/import via the Deck Controller or MediaLog, etc., and transcode to DNxHD prior to editing. In addition to DNxHD, you can also work in uncompressed 8-bit or 10-bit footage within Media Composer. Once you finish editing, you can grade with tools like Baselight, Composite Suite Pro, Red Giant Looks, etc. You can add effects and filters with the many plug-in options available, or with Media Composer’s in-built effects library. When you’re done, you can output directly from Media Composer, or you can conform to Symphony for grading and finishing in the resolution of your original media. If you want to work in another application like DaVinci Resolve, you can export an AAF. Want to make deliverables for the web or DVD, etc.? Use Sorenson Squeeze Pro. It can be as simple or as complicated as you want it to be. That’s the defining mark of Avid Media Composer. In Part Three we’ll look at how to configure your system and project settings for best results.